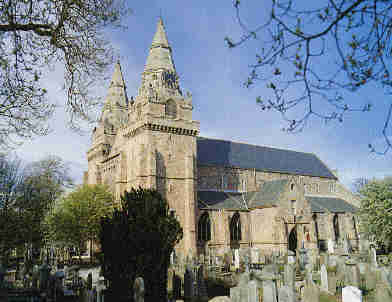 John Richie led the bass section of the choir at St. Machar’s Cathedral in Aberdeen, Scotland, while Testristina Adams was a contralto. They sang in the choir for about 10 years, and fell in love. 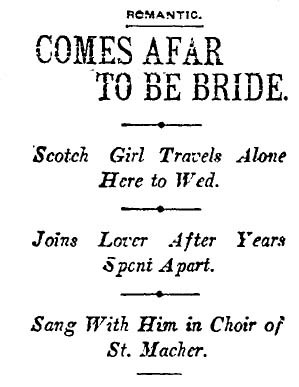 Two years ago, in hopes of more opportunity, John left Scotland and came to Los Angeles, but not before asking Testristina, a pretty brunette, according to The Times, to marry him. “If I had not said that I would follow him he would never have come,” she said. Testristina said that of the people in her railroad car traveling from Chicago, 80 were planning to settle in Los Angeles. “All of them had nice things to say about California,” she said. Aside from John being selected as a soccer referee in 1908, I can find nothing else about the Richies in The Times, despite Testristina’s extremely unusual name (The Times also spelled it Testrestina) but I hope they had a long, happy life together and many grandchildren.